Texts from Mittens is a series of text message conversations between a snappy, self-absorbed housecat named Mittens and his long-suffering human, a single woman who works away from home during the day. Mittens relentlessly hassles his human all day long, while only taking breaks to watch Judge Judy, hang with his best friend Stumpy, complain about the antics of Drunk Patty the neighbor, ask Grandma for money to buy useless items from QVC, and harass the “filthy beast” dog, Phil. 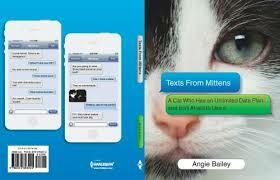 Texts from Mittens is written by Angie Bailey, an award-winning writer and blogger, humorist, and professional member of the Cat Writers’ Association. Her primary blog, Catladyland, has won many awards, and her humor writing is featured nearly daily on Catster.com, one of the most popular cat sites on the Web. She loves to photograph her cats in silly poses and sleeps with one eye open. And yes, she has three cats. Texts from Mittens is available now for pre-order on Amazon. It is available as both a Kindle version for $6.64 and hardcover for $10.30 with a release date of March 31, 2015!